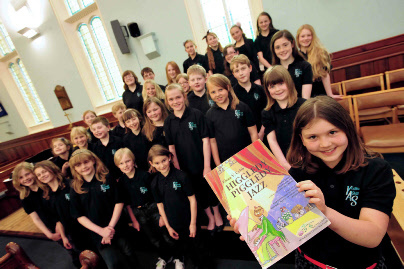 As part of the Ashbourne Festival, the Young Ashbourne Singers performed a musical – ‘Higgledy Piggledy Jazz’, written by Elena Cobb, called ‘The Importance of Being Happy’. 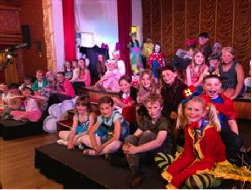 Directed by Linda Perry Smith and accompanied by Steven Duckworth and a live jazz band, in the Empire Hall, Ashbourne, the performance was a sell-out and great fun for all involved. 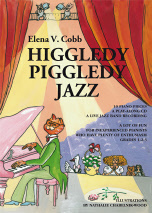 We welcome you to the premiere of Higgledy Piggledy Jazz, a new toe-tapping musical composed and produced by Elena Cobb. Stinky and Pinky, the little pigs, narrate the story of Molly Spencer, who learns the importance of being happy to overcome her fears, with the help of the Star Dust Doctor and Mrs. Van Der Blond, with a visit to a magical ‘Cloud Seven’! 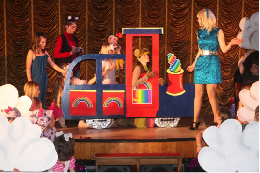 The opening scene is Molly’s 7th birthday and that night, as she falls into a magical dream sleep, we see her presents, the Barbie doll, cat, fluffy duck and cuddly teddy bear come to life along with the other toys in her bedroom. 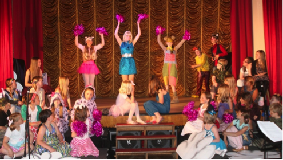 Performed by local children, the shining stars of the Young Ashbourne Singers, the show has been directed by Linda Perry Smith, accompanied by Steven Duckworth and the live jazz band! Elena Cobb is a classically trained and highly experienced pianist, teacher and composer; having taught extensively both in her home country of Russia and the United Kingdom. 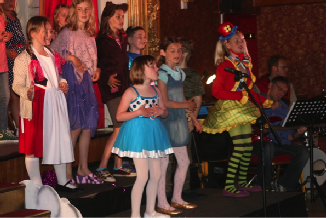 As her experience grew, Elena began to see where teaching children music could be bettered and she became determined to make improvements that would benefit children and turn their involvement in music into a more exciting and enjoyable experience. Part of this drive has seen her composing music specifically aimed at appealing to children, taking into account their limitations and abilities, their need to have fun and feel confident about performing to family and friends. Elena is full of ideas and projects and tries to combine composing music and creating innovative ways of teaching to benefit all children. Continuously inspired by the musical world around her she has composed and published several books – including her ‘Higgledy Piggledy Jazz’ music series. 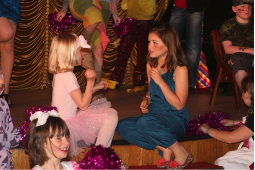 This has now been developed and expanded with dialogue to create the Higgledy Piggledy Jazz performance here tonight. 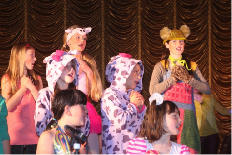 Elena delights in seeing children relish in the joy of music and is so excited to share with you, Young Ashbourne Singers performing under the direction of Linda Perry Smith, the premier of her musical, Higgledy Piggledy Jazz. Ashbourne Festival 2013 saw the debut of Higgeldy Piggeldy Jazz’s performance of The Importance of Being Happy, written and produced by Elena Cobb with young musicians and performers from Young Ashbourne Singers. 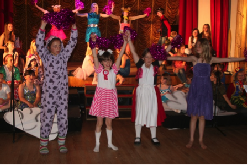 This sell-out performance was enjoyed by a very appreciative audience whose excitement was only beaten by the enthusiasm of the children whose enjoyment of performing this lively and colourful event was a pleasure to watch. Ashbourne Arts was extremely pleased to promote and be involved with this event. 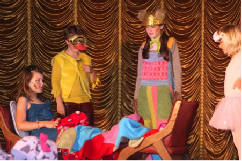 The remit of Ashbourne Arts is to encourage young people to be involved with the arts. 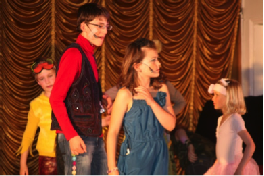 Higgledy Piggeldy was a great example of youth involvement that fulfilled this area and one which Ashbourne Arts would like to continue.